A fun addition to any kitchen! 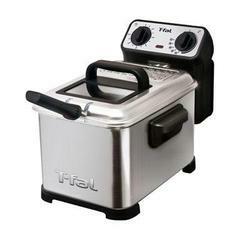 Try this handy electric T-Fal/ Wearever Family Pro Deep Fryer for deep fat frying delicious chicken fingers, french fries, fish, fritters, donuts, and more that your family will love. It offers an adjustable thermostat, view window, and temperature ready light for your cooking convenience. The two position basket with a folding handle holds up to 2.6 pounds of food in 3 liters of oil. The family will love it! Brushed stainless steel Offers an attractive, durable finish. Adjustable thermostat Provides setting a temperature and allowing the fryer to hold that temperature constant, or bringing the oil back to the setting when food is added. Two position basket Holds up to 2.6 pounds of food in 3 liters of oil. Folding basket handle Collapses for storage. View window Allows checking on cooking food without lifting the lid. Temperature ready light Indicates when oil is hot enough to begin cooking.